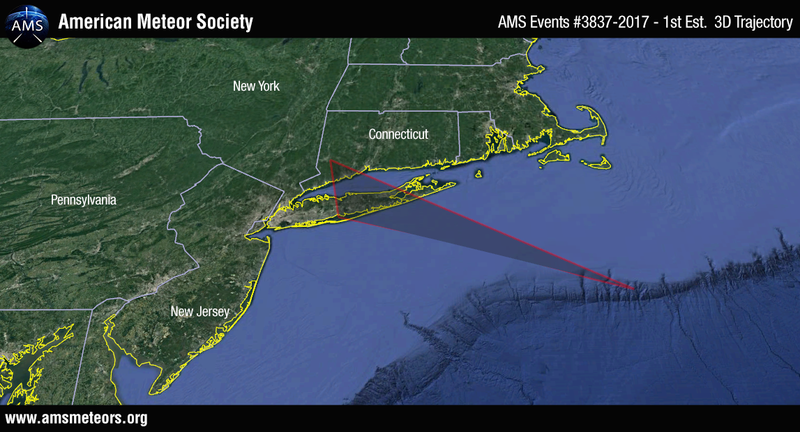 The preliminary 3D trajectory computed based on all the reports submitted to the AMS shows that the Fireball was traveling from North East to South West and ended its flight somewhere above the Nantucket Canyon in the Atlantic Ocean. I was fishing just north of sea bright public beach around 3:00 yesterday, and out of nowhere a bright pink object appeared in front of me, mic d in with the gulls. Didn’t look like it was in the atmosphere, looked to me like it was within a few hundred yards. Again did not appear to be far away. I have seen plenty of fireballs in my life. This object appeared to be metallic pink and was moving slowly and accelerated away from me heading south. It was almost as if it was sitting still for a moment. Then shot away from me with a bright green flash. Meteor? What ever you say. I say, NOPE. It’s probably just a atmospheric air combustion. The air traps light and the light reacts. Was it on a cold day or fairly warm. How do you figure it’s over Long Island this picture is in Sea Girt, New Jersey…. It went over north of me in Preston CT. I could hear it before I saw it. You couldn’t hear it first. Sound travels much slower than light! Huh … He could have heard it first and looked later, as often happens with airplanes and lots of other moving objects. I saw this from bedford nh while I was driving south! I saw this driving from Manchester NH – it crossed directly in front of me, going west / north-west. Very quick, then it was gone. I was going South, just after the Airport exit. It looked very close, not up in the atmosphere. Note: an error calls for correction. 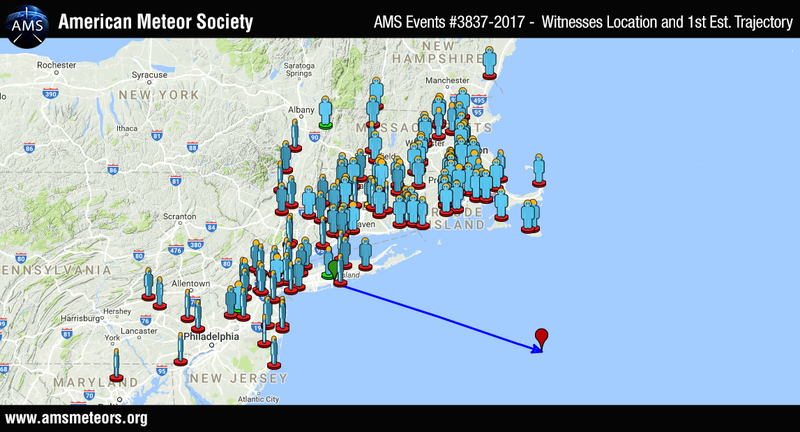 The fireball traveled from northwest to southeast, NOT “from North East to South West”. Was it the chinese space station that is known to be out of control and soon to crash into our atmosphere ? Too soon. Should be in a few months. I saw it on Long Island heading south before SCC. Scared me and the driver ahead of me that braked from being startled as well.